You can find Corrina here and her Ravelry group is here. I find inspiration everywhere. I take pictures with my phone of architecture, things on the TV. I sketch the drape and style of store-bought sweaters folks are wearing in meetings. I have a bulletin board and notebooks full of sketches and ideas. Could you tell us a little about your love of lace knitting? I think the best part of lace is the magic of blocking. You're knitting along, making a fuzzy lump, and folks look at you funny. And then you block it, and it's magic. You've made something amazing and beautiful - it was hidden in that fuzzy lump all along? What is your favourite knitting technique other than lace knitting? Right now I am totally in love with slip stitch colorwork. 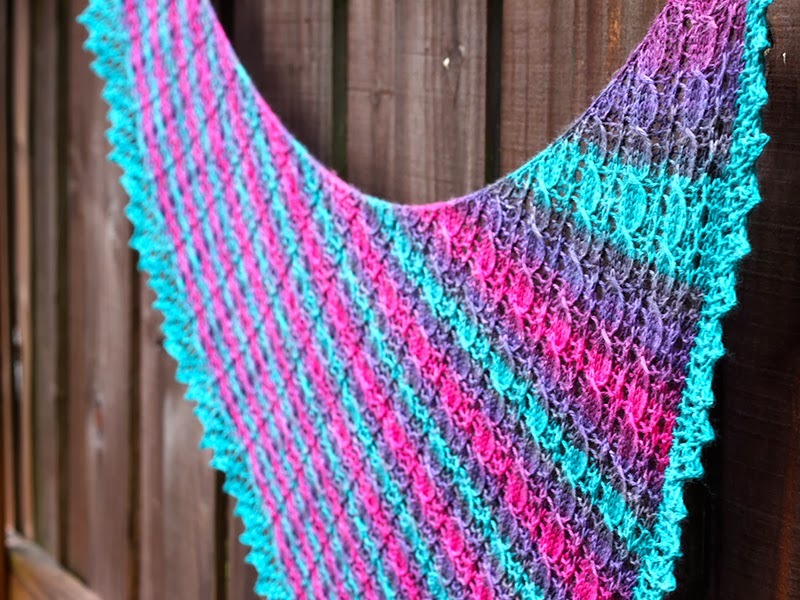 I recently did a shawl called Biellese and now I want to make everything in slip stitch. So many pretty applications of that sort of patterning and I think it's a great way to use variegated yarns. I have ideas! How did you determine your size range on your garments? Most of my garments are for magazines so I go by their standards. I've just started self publishing garments - my Dolinger sweater is offered in sizes from 32" - 50" bust, which is about what I shoot for. I figure the knitter can decide what they want to wear, it's not up to me to discriminate based on what size I think might look good in a certain style. And being plus size myself I like having options! I keep an eye on the hot right now list on Ravelry. But there are so many designs published that there's no way to keep up with it all. I try to make sure I'm not copying someone else's work, but I don't worry too much about being influenced. I just do my best to do unique things. I hate written instructions for my lace patterns. I want everyone to read charts. But I realize that many folks can't or won't read charts, so I try to offer written instructions as often as possible. 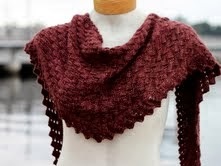 That said, I think there's a market for all sorts of pattern types, but I worry that's there no way for a knitter to know what sort of pattern you write until they buy it. I don't like it when folks are disappointed. I have three reliable sample knitters that I need to use more often. I just need to get ahead of my work load so that it's feasible to farm things out to them. Sometimes I change things on the fly when I'm knitting and you can't do that if someone else is knitting it for you. I did not. I'm kind of coming from behind and trying to make one now. My business grew faster than I expected in the last couple of years, and I'm trying to carve out the time to really revisit that issue. That and marketing. I really need to work on my marketing. I have a couple of mentors. A handful of folks who are way more experienced than me that I hit up, and then some folks I would consider one or two steps up contemporaries - if that makes sense. Folks that have more publishing experience than me that I use as sounding boards. I'm very lucky in that area! I wish! Like I said I really need to go back and do a business plan. So I can guide my business more in the coming years instead of just following it where it goes! I would not have a business were it not for the internet. I didn't start selling patterns until Ravelry came along. I was teaching in my LYS and selling patterns there that I printed on my home printer. But when Ravelry exploded I was able to start selling my patterns online. Self-published PDFs are my bread and butter! Absolutely! I find a tech editor way more reliable than the test knitters I had used in the past. I still use test knitters for some work. But having a tech editor has made all the difference in the PDFs I put out now. I'm still going backwards and updating my old patterns, but there is a great difference in my early work versus my current work. And I don't mean issues with errors - my tech editor makes sure my patterns are more clear and consistent than they've ever been, which is particularly helpful now that I'm having patterns printed for LYS distribution. I don't! That is honestly the hardest part of my business. I get a lot of my best work done after everyone else in the family has gone to bed. Which makes for a very sleepy mama when the boys have to get up at 6 a.m. for school! I try to carve out time for myself during their school days, and luckily when I'm knitting my work is very portable. But sometimes you just have to say enough and put it away and really concentrate on family time. I've been blessed so far (knock on wood) that I've only had really nasty critiques come my way a handful of times. Sometimes I vent (privately) to my closest designer friends, but mostly I blow it off. The older I get, the less it bothers me! Well, I'm married with two teenage sons, so I couldn't support our entire family on this income. But I could support myself - probably the last two years. My first pattern was published in the fall of 2007, so I've been doing this for six years. But I really didn't get serious about things until 2010. Have a sugar daddy? Just kidding! I think you have to be realistic about the income levels (and the fluctuations in income) that a business like this offers up. Also, you need to be self disciplined - knit design and sample knitting and the like are all deadline based businesses and you'd be amazed how often life wants to get in the way of a deadline! And my best piece of advice is don't choose a cutesy name! I'm stuck with picnicknits and if I had to do it over again I would just go by my name. Trying to change your branding (as I am right now) is a nightmare!